Gallery 9 is pleased to present Circumstantial Evidence, Simon Blau’s thirteenth solo exhibition at the gallery. Blau’s latest paintings read like fragments of a story that can only be partially pieced together. 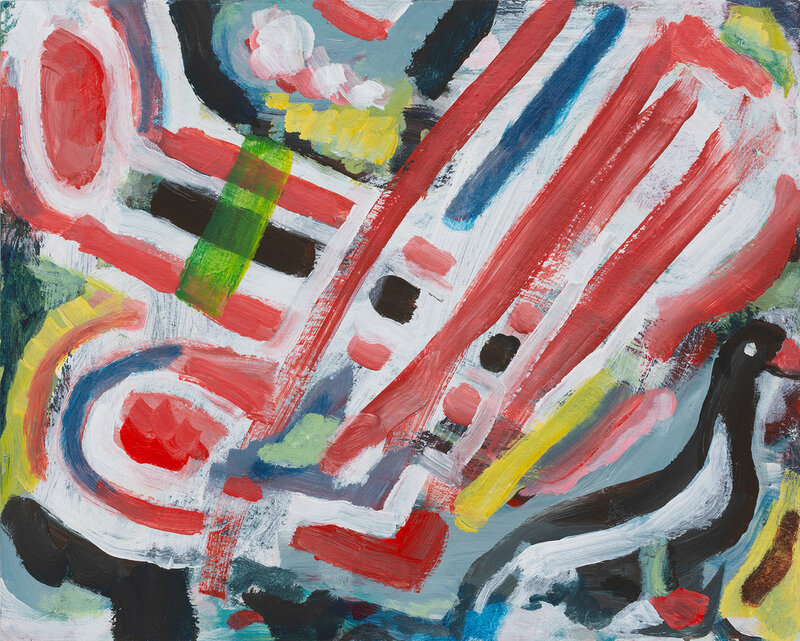 Subjects emerge out of rhythmic currents of line and colour, painted in Blau’s distinctive palette of green, red, pink, white and grey. His approach is direct and urgent, as if the paint needs to be put down quickly before the image comes into focus. He revels in the kind of associative freedom this rapid process allows: boats, elephants, figures, horses and missiles loop and churn into the high-keyed abstract scaffolding. Blau’s exuberant mark-making acts like a connective tissue, merging together disparate ideas into a surprisingly psychic whole. Each painting is a foil for the interior life – for the non-linear narratives that make up our private thoughts and dreams. Simon Blau lives and works in Sydney and has been exhibiting regularly since the early 1980s. His work is held in numerous private and public collections including The National Gallery of Australia, The National Gallery of Victoria, Wollongong City Gallery, Artbank and the Baillieu Myer Collection of Contemporary Art, Melbourne.